It was another Saturday afternoon when me & my family had to ponder about what to eat for lunch. My aunt had a sudden craving for pizzas & not wanting to buy the usual food take-out ie chicken rice, noodles, mixed rice you name it - got me to place the pizza order on the phone. I ordered our personal favourites - Aloha Chicken & Classified Chicken in NY Crusts, onion rings & chicken wings in barbeque sauce - waited for approximately 20 minutes until the delivery guy came knocking at our door. I was surprised by the different pizza packaging box the minute he took them out of his heating bag. So this is what Domino's been hyping about - not just "First Class" pizza but "First Class" packaging too. 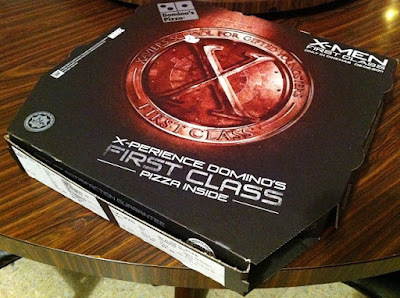 For those of you who're unaware, Domino's has launched 3 new flavours namely First Class pizzas in conjunction with the upcoming movie, X-Men: First Class. The new flavours which consist of Tuna Extreme, Chicken Perfection & Shrimp Passion feature the new pesto sauce. I haven't tried any of them as it can be pretty pricey due to the surcharge for different sizes. Anyways, it never occured to me that Domino's would apply the First Class packaging design to all pizzas, not just its First Class range - which I felt the box is particularly cool but...on 2nd thoughts, may not be a good colour for food.